00:10:00 Makes 6 servings, 1 cup (250 mL) each. Makes 6 servings, 1 cup (250 mL) each. Whip up a pitcher of our Sparkling Fruit Cooler - it's a fruity summer punch made with pineapple juice, white grape juice, pink lemonade and a splash of gin. Make a double batch if you're serving a crowd. Add juices and water to drink mix in 1.5-L plastic or glass pitcher; stir until mix is completely dissolved. 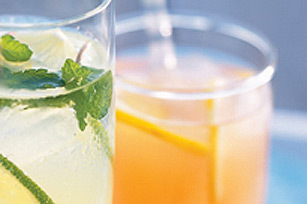 Serve over ice garnished with lemon slices. Omit the gin and increase the grape juice to 2 cups. To turn this drink into a slushie, pour prepared drink into 13x9-inch pan. Freeze a few hours or until slushy, then flake with fork into small ice pieces. Scoop into glasses and serve with straws. Serving Size Makes 6 servings, 1 cup (250 mL) each.